As night fell for some and morning broke for others a strange organisation was afoot as vehicles were being tested and arrows laid down on aeon pathways in the dead of nigh, or morning, maybe evening depending on which part of the world you were from. As the list of wacky funny transports were laid out you knew we were in for a fun ride. You may remembered the bathtubs timed trials for the GFC book of record arranged by 6 of 9 (Yalene Resident) who we all know can throw an event in style. She has taken the race once step further and now its not just a race but a race with a difference. 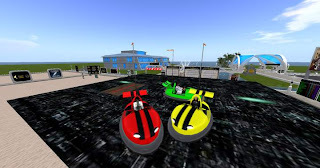 The race would last five laps of a specially marked out track and after every lap your required you swap vechles to another pre-selective one. If that wasn't wacky enough the modes of transport were equally bizarre from being pulled in a sled by a husky dog, pushing yourself along on a rubber ring or powering down the signed path on a motor bike. A group of us lined up at the starting post with 5 laps of mayhem between us and glory, Yalene put us under starters orders and we were off. The 4 wheeler bike was our first vehicle, slightly...well more than slight, over sensitive one extra flick of the keyboard and you could be swimming with the fishes in the lake. The dog sled was a lot more forgiving, almost sliding majestically rounds the tight corners of our makeshift Aeon track. 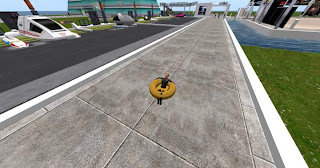 Then it was time for race toob a yellow rubber rings normally used in water of paddling but will happily multi-tasks as a lands/sea vehicle, you get the picture, grown avatars flaring their arms around in a ribber dingy, there was much merriment in the stands of onlookers. By this time most of the contestants were either swimming with the fishes or had wrapped their vehicles around the nearest lamp post. 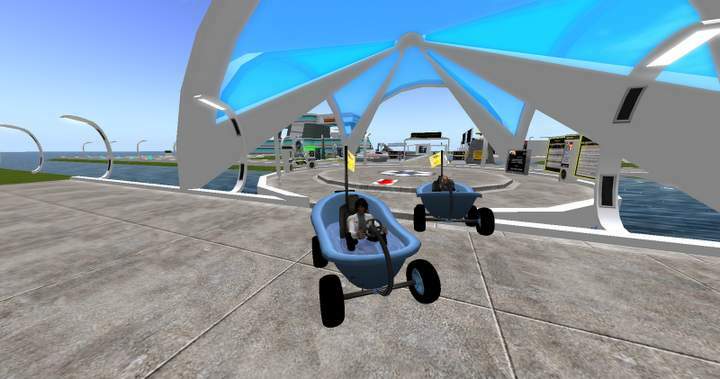 Which left just me and 7 0f 9 (Zannadu Resident) contesting for the title of wacky racer of the GFC. 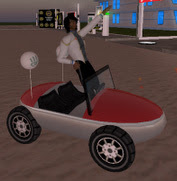 Though the word car wouldn't be totally an accurate description, the bathtub, as its name suggests is a bathtube on wheels which steers like a cow with a ten ton weight attached to its tail. A this point in the race I was well ahead, but my bathtub driving skill were letting me down as I swayed from side to side, some how only able to direct my bathtube into objects like a magnet attracting metal. As I bounce off signs, street lamps or anything which was solid i could feel 7 of 9 breathing down my neck, soon we were side by side, wheel to wheel, rubber ducky to rubber ducky, I held my ground and watched as 7's bathtube careened into lake (she claims i nudged her into the lake, but i wouldn't do such a thing). So I had a clear road a head of me, took the final turn at the ops center straight to the finishing line. As i turned round i could see 7 limping behind in her bathtub. 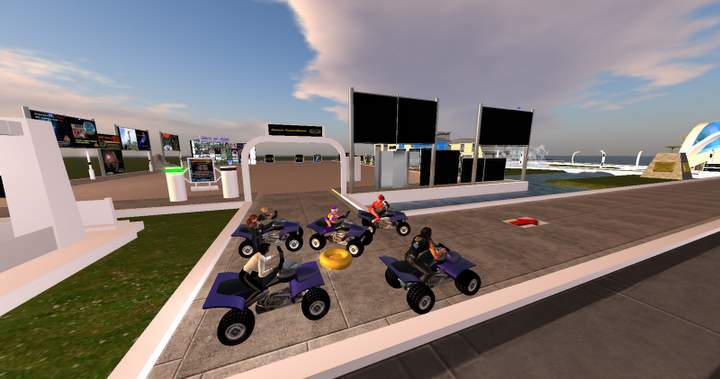 And while we were at it 7 of 9 (Zannadu Resident) thought wouldn't it be fun to have a bumper car event, so she placed a raised platform up above the sandbox with a bumper car rezzer. We needed no excuse to jump in them trying to knock each other off the platform. Others joined in to the crash frenzy event with cars flying off the edge like lemming to a cliff. 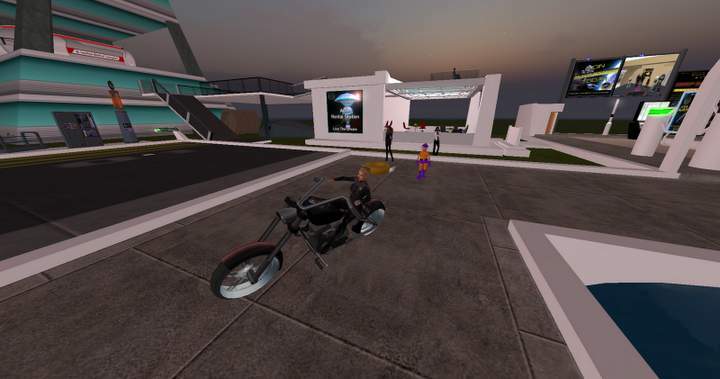 I have the say both Yalene and Zannadu laid on two fun library/research events for the anniversary, that put a smile on the faces of those who attended. Now, just one more time round the Aeon track without crashing into something.